When you visit the Dogwood Garden & Pet Center, there’s a good chance that Brian, a Lambs Farm Participant, will greet you with a big smile. Brian creates bonds with the puppies, but he is ecstatic when families leave with one of his buddies in their arms. In fact, Brian enjoys helping customers through the adoption process. Clover is grateful, too. She loves her new family and is always the life of the party. The Fojtik’s look forward to all the future memories with Clover by their side. “We will always care well for her and think fondly of Lambs Farm,” Kelly said. The enthusiasm, attitude and joy Brian brings to the Dogwood Garden & Pet Center is what our Co-Founders envisioned when they opened the original Pet Shop on State Street in 1961. They would be incredibly proud. The Magnolia Cafe & Bakery is kicking off summer with a new line of FIT Meals. A FIT meal is a recipe that is under 500 calories, reduced in sodium, carbohydrates and unhealthy fats. Most FIT meals have a focus on entree salads and vegetarian dishes. FIT meals are complete with a side of fresh fruit and fresh brewed iced tea or coffee for just $5.99 – stop in today! At age six, sign language was merely an interest for Sarah. 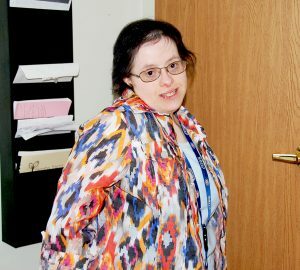 Years later, her skill has given her the passion, determination and voice to speak on behalf of the special needs community at Lambs Farm and beyond. Sarah’s story begins with Linda Bove, the actress with hearing loss, also known as Linda the Librarian on Sesame Street. Sarah recalls being captivated by her personality and ability to teach American Sign Language to children with and without the disability. Sarah’s parents saw how fascinated their daughter was with sign language and knew it was something she had the ability to pursue. In no time, Sarah was signed up for classes at the local Park District. Sarah in her Lambs Farm house. When she completed the beginner courses, it was evident that Sarah found her passion. She was considered advanced in sign language after her 12-week course and continued her education with a private instructor. As Sarah’s signing skills developed, she moved on to Harper College to focus on linguistic analysis and interpretation. She ended up graduating at the top of her class. “I wanted to use my skills to give back to the community,” Sarah said – and she’s done just that. Also during that time, Sarah and her mother, Mary Anne, were part of a Sign & Story program at the local library. Mary Anne read the stories aloud while Sarah signed and taught children their ABCs. At the heart of Sarah’s goal in learning sign language was the hope that she could be a role model to others with developmental disabilities. As someone who has been both a target and active bystander of bullying, Sarah believes people need to look beyond any disability and see someone for who they are as a person. Sarah’s passion and spirit continues to grow at Lambs Farm. She has a job and her witty, fun personality is loved by all. She makes it clear that nothing can stand between her and her dreams, as she aspires to be a sign language instructor, actress and motivational speaker. After meeting Ursula, the Magnolia Café & Bakery’s Assistant Manager, and touring Lambs Farm’s ceremony and reception spaces, Ashley and her husband knew this is where they wanted to tie the knot and begin their journey together. They were drawn to the laid-back, rustic farm feel, as well as the high quality and budget-friendly services. When wedding day arrived in May of 2016, guests were impressed by the open patios, bar, the breathtaking views from the ceremony location and the countless options for photos that will be cherished forever. The Wellness Center’s new theme for 2018, The Good, The Bad & The Healthy, employs different learning tactics to help Participants recognize what the good, better and best practices are when it comes to food, activity and safety, as well as the negative effects unhealthy choices have on our bodies. To kick off the new year, the Wellness department crafted a Fitness Challenge. Participants and staff put forth their best effort to earn the fastest time or complete the most reps at each station. Each competitor did pull-ups, a walk-run, squat ups, sit and reach, a rope pull, step ups and push-ups. Those who competed in the challenge received a prize for taking the step to be active. After the challenge was complete, statistics showed promising results. Out of the 22 Participants who took part in the challenge, 18 were people who do not exercise daily. The Wellness staff believe that these kinds of challenges will continue to spark interest and guide Participants on their wellness journey. As part of this year’s theme, there will be a showdown, presentation or interactive activity to emphasize the importance of making healthy decisions. Participants are already looking forward to what’s in store for February.